Results: Furthering work involving the Graph Engine for Multithreaded Systems, or GEMS, a multilayer software framework for querying graph databases developed at Pacific Northwest National Laboratory, scientists from PNNL and NVIDIA Research used GEMS to customize commodity, distributed-memory high-performance computing (HPC) clusters and apply graph algorithms to large-scale data sets on clusters. By incorporating GEMS, HPC query solutions, such as parallel processing, are exploited and results are more predictable. Moreover, GEMS translates SPARQL queries, a Resource Description Framework (RDF) query language, to C++, a general, cross-platform programming language, more efficiently to optimize HPC-based graph-matching methods. In their comparison with alternative approaches, GEMS provided noticeable speedups, particularly with larger data sets. © 2015 IEEE. Enlarge Image. 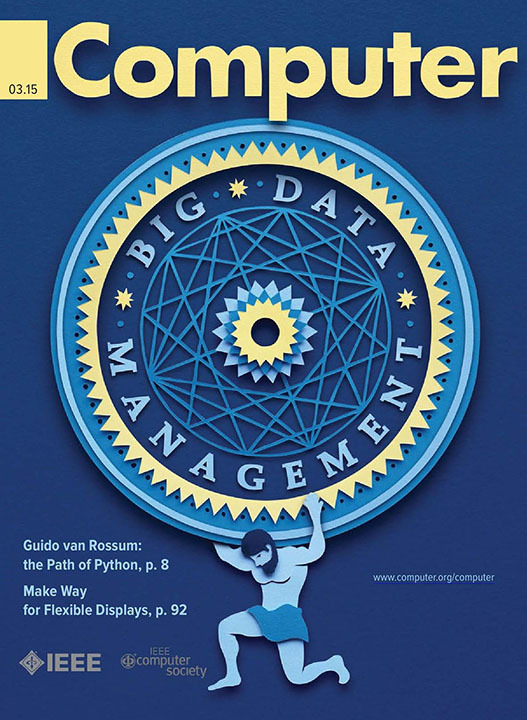 This work is featured as part of the March 2015 special issue of the Institute of Electrical and Electronics Engineers Computer Society’s flagship publication, Computer, devoted to efforts surrounding Big Data management. Why it Matters: As data sets grow increasingly large and heterogeneous (or, “too Big”), their value diminishes if they cannot be mined with precision and purpose. The Semantic Web adds meaning to information on the Web by promoting common data formats that can be more readily located, shared, and used. Often, the RDF model, specifications originating from the World Wide Web Consortium, is used to link varied data, making the information more viable for query and analysis. In earlier research, GEMS was shown to manage data volume challenges associated with employing a graph-based data model. This time, data mining through graph methods using the GEMS framework on currently available computing components, or commodity clusters, affords more efficient use of space and added performance by exploiting graph parallelism. Methods: Different from other RDF engines, which resort to more conventional relational databases approaches, GEMS mostly employs graph methods to process SPARQL queries. The core syntax of SPARQL is a conjunctive set of triple patterns, called the “Basic Graph Pattern,” which represents subgraphs to match against the RDF data. In GEMS, SPARQL queries are modeled as graph homomorphism routines, enriched with solution modifiers (e.g., sorting, aggregation) to support the features offered by SPARQL. These methods are automatically implemented in C++ by mapping the basic query operations to highly parallel functions selected from GEMS’ Semantic Graph Library (SGLib). To obtain efficient implementations, the translation engine includes several analysis and optimization steps, conducted on different representations of the input query, which range from its algebraic representation to dependency graphs. The optimization process identifies an optimal execution plan among several candidates, according to a cost model and a cardinality estimator. Then, it performs data-flow and call-graph analysis to improve task-level parallelism exploitation, reduce data movement, and curtail the memory footprint of data structure. The process also identifies the particular sequence of basic operations that can be combined into more efficient complex operations. What’s Next? Ongoing GEMS code development will improve query performance, for example, by using statistics gleaned through data probing. Also, the researchers still are finding ways to augment C++ graph-matching operations by accounting for data characteristic sets. Acknowledgments: This material is based on work supported by the High Performance Data Analytics Program, a collaboration between PNNL, Mississippi State University, University of Washington, and Georgia Institute of Technology. The U.S. Department of Energy’s Office of Advanced Scientific Computing Research, the Center for Adaptive Supercomputing Software at PNNL, and PNNL Institutional Computing also provided resources benefitting this research. Research Team: The PNNL team includes: Vito Giovanni Castellana, Alessandro Morari, Antonino Tumeo, and David Haglin. Oreste Villa is with NVIDIA Research. Jesse Weaver is with Google, and John Feo is with Context Relevant. Castellana VG, A Morari, J Weaver, A Tumeo, D Haglin, O Villa, and J Feo. 2015. “In-Memory Graph Databases for Web-Scale Data.” Computer 48(3):24-35. DOI: 10.1109/MC.2015.74.